As much as he loves his new friends, he can’t ignore what’s ahead. He’s beginning to lose the function of his hands, and soon he’ll become even more of a burden to his mother. Inspired by the death poems of the legendary Japanese warriors known as samurai, Sora makes the decision to leave life on his own terms. And he needs his friends to help him. I stare at the cursor blinking expectantly at the top of the page. There are so many choices; honest, funny, brave. A superhero with a tragic past and bright, mysterious future; with superstrength or telekenetic powers. I could be anyone and they would never know. People say that is the problem with the Internet; pedophiles, murderers, con men, the Internet makes it all too easy to hide. But I like it. I type “SamuraiMan” into the first box, then my fingers come to rest against the keys again. I know I’m overthinking this, but it has to be right. Put all these boxes together and you’ll have a picture; a picture of me. Outside the computer, nobody sees Abe Sora anymore, they only see the boy who looks weird, the boy who cannot walk, the boy who needs assistance. The boy who’s going to die. At first, they thought that the aching in my legs was the flu and nothing more, but the weakness grew, and one day, out on the baseball field, I fell. My legs stopped working. The tests seemed to go on forever. Nobody knew what was wrong with me. They probed and prodded and asked a million questions. Every theory proved wrong, every disease and condition crossed off the list, until finally they found an answer. I knew as soon as we opened the door. The doctor gestured to the empty seats, his face so serious, and I knew. They say that a warrior must always be mindful of death, but I never imagined that it would find me like that, in a white room with strip lights buzzing overhead. “That’s the bad news,” he sighed. He was staring somewhere between us, as though he could not bear to look at us. I remember thinking, Is what I have so terrible that he cannot even stand to say it? Will looking at me make him sick too? I imagined germs flowing from my fingertips, infecting everything I touched. I tried to pull away from Mama’s grasp, but her fingers were tight with fear. I glanced across at her, watched her eyes desperately searching the doctor’s face for clues. She looked tired. I noticed it for the first time that day. She has been tired ever since. The doctor stared over my right shoulder as he recited symptoms, using big words that meant nothing to me then—“atrophy” and “fasciculations,” then “neurodegeneration” in what should, I’m sure, have been a reassuring tone. No cure. And since then, even to my mother, I have been the boy who’s going to die; but here, here I can be anything. My mother’s voice interrupts my thoughts, calling, “Coming!” as she shuffles down the hallway. I hear the latch and the soft creak of the door, polite voices, too quiet for me to recognize. I glance at the clock, as if that will hold the answers, even though neither my mother nor I have very many visitors these days. It’s . . . difficult. Embarrassing. No one wants to be around us anymore. I listen for any sign of who the visitor might be; a cough, a laugh, the rhythm of familiar steps. Nothing. I can’t tell. Holding my breath at every sign of company has become almost a ritual. Every time I hear the door, the telephone, a stranger’s voice, I wonder, who else is going to know my shame? Who else will stare, not knowing what to say? Finally, the door closes and my mother’s gentle footsteps move back along the hall. I rest my head against the monitor of my computer and breathe a long sigh of relief as the cool glass spreads its calm across my skin. They’ve gone. I’m safe. “Sora?” Mother knocks at my door. “Uhh.” I groan, turning my face toward the door. The cool of the glass shifts a little. I imagine that the cold is an iceberg, that I’m alone in a desert of ice where everything is clear and fresh and quiet. But I am not; my mother speaks again. “We?” I panic, sitting upright and pushing away from my desk, suddenly aware of how small my room is, how intrusive the large wheels of my chair are in this little space. There is nowhere to hide. Who would visit unannounced? I never really had friends at school, more acquaintances. People you could joke with in the classroom, but no one special. I preferred my own company and the quiet of the library, especially in the last months. I grunt, and the door slides open. My mother smiles at me and steps aside, ushering in the school’s baseball captain, Tomo, and a girl I think I might have seen in the corridors of school, hunched below a cello case. I squint at her. Yes. Just before I left she caused a ruckus, leaving her first chair in the orchestra to start a rock band. They look odd together, short and tall, gutsy and clean-cut, the musician and the jock, but she’s clinging to him tightly. What are they doing here? Neither of them has ever been to my home before. We’re not friends; we’ve barely even spoken. They stand in the doorway for a moment, exchange glances. And I know; someone made them come. And neither of them wants to be alone with me. The cripple. The sick. The dying. “Hi,” they say in unison, still not stepping over the threshold. For a moment we just stare at each other, until I cannot stand it any longer. “Come in, make yourselves at home.” I force myself to smile as I speak. They step forward, one step, two. “This is Reiko.” Tomo shrugs himself from her grip. I gesture to the bed, with its neatly turned sheets. She sits, fiddling nervously with her plaits, but Tomo paces, swinging his arm like he’s warming up to pitch a ball. He stops and stares at the wall above my bed, the poster of Katsuhiro Maekawa, pitcher for the Tigers in the 2004 match against the Yankees. Below that, the shelf with my catcher’s mitt, my limited-edition silver bat, the ball signed by half the current team. And my baseball cards. Most of them are kept neatly in folders, organized by team and season. One, however, showing the face of Yoshio Yoshida, sits alone on the shelf looking out at me. It is a duplicate; he’s safely stored away with the rest of his team as well, but I like to think that he is watching over me. I nod. The signature is barely recognizable; wonky and left-handed. Tomoaki Kanemoto had smiled at me and signed the ball even after playing through the game with torn cartilage. That day, every boy in the bleachers learned about determination. He frowns at it for a moment, squinting. “Is this from 2004? That game?” he asks, eyes wide. Games like that are not forgotten. Every pair of eyes is glued to the action, every heart longing to be down there on that green, soaking up the glory. Tomo might actually make it there one day. He’s good. I always wished that I could pitch like him. “Yeah, maybe. Thanks.” I have no intention of watching the high school games, the team I should be on. I will never step onto the field or sit in the bleachers and cheer again. I know it, and Tomo knows it, and an awkward silence eats up all the air again. “To me?” I was only ever a B-team, after-school-club player. I’m glad he has the decency to look ashamed. What does one say to that? I am not a circus lion. I can feel an angry heat rising up my neck. It should not matter what the people of my past think. But it does. I am nothing but the sick boy. It is always like this. And suddenly a hundred awkward pity-moments flood my synapses, hit me all at once. Tomo and his girlfriend need to leave now; I need my room back. But as the seconds tick by, neither of them moves, they just stare, and suddenly there is not enough air in here for three of us and I want them to leave right now. She stays just for a second, then sighs and follows Tomo out. I hear them walk down the hallway, and thank my mother. As the door clicks shut behind them, I breathe. Slowly, the air clears, and after a few minutes alone I turn back to the boxes on my screen. I imagine myself passing Tomo in the hallway, sliding clumsily into home plate, sitting in a classroom without thirty-five sets of eyes on me. I am not exactly lying. I would love to spend my days in lecture halls until my hair is as white as the chalk dust floating through the air. I just . . . will never get the chance. But they did not ask me that. I read the words again from start to finish and try to picture what someone else would see; what do I look like to a stranger? But even I struggle to see myself without this disease. At the bottom of the screen are two buttons, save and post. My finger hovers over post, but those shocked, sad faces from the school halls and the streets flash right before my eyes, judging me, and I do not click. I can’t. I’m not ready. Sora, age seventeen, will never grow old. He has a terminal illness, ALS—known as Lou Gehrig’s disease—which means he will gradually lose the use of his body, starting with his legs. Sora, who lives with his caring single mother in Japan, takes refuge in Internet chat rooms, where no one can see his problems. Under the user name SamuraiMan, he makes two good friends online. The three start meeting in person, filling Sora’s last days with a joy he never expected. But when his illness worsens, he must ask his friends an almost unthinkable favor. Like the Samurai whose death poems he cherishes, Sora wants to die on his own terms, with dignity and surrounded by love. 1. Why does the author, who’s British, set the book in Japan? Which aspects of the story are connected specifically to Japanese culture but which could take place anywhere? 2. Sora says of his relationship with his mother, “We’re a perfect team.” Why does he think that? How does their relationship change in the course of the story? 3. Sora sometimes blames himself for being a burden to his mother. Analyze why he feels that way and what you think his mother feels, based on the text. 4. What does Sora mean when he says that people treat him as “the boy who’s going to die,” and how does he feel about it? Find examples of people treating him that way and times when they don’t. 5. Describe Sora’s relationship with his grandparents and his visit with them. What are the good aspects of the visit? What are the good aspects of returning home? Talk about the bakeneko and the cat that Sora helps choose. Why do you think they are part of the story? 6. What role does Doctor Kobayashi play in Sora’s life? Discuss whether you think she is helpful to him. 7. What are the characteristics of a bonsai tree? Talk about the bonsai tree in Doctor Kobayashi’s office, how it changes in the story, and what it might symbolize for Sora. 8. Doctor Kobayashi gives Sora Death Poems: Last Words of the Samurai. How do the poems affect him? Find different examples of the poems in the text and relate them to what Sora is experiencing. Discuss the meaning of the poem in Chapter 85. Why do you think the poem makes up an entire chapter? 9. Why does Sora call himself “SamuraiMan” online? Find places in the story, other than the poetry, where he thinks about warriors and their approach to life and death. Why is the warrior’s way such an important influence on him? 10. According to Doctor Kobayashi, the samurai knew that “what matters is not how much time you have, but how you use it.” Discuss that idea and whether you agree with it. Do you think that Sora used his time well? 11. Talk about how the Internet frees Sora to “be anything” and why it makes him feel like “the old me.” Discuss his reactions to other teens online and what they discuss. Why does he end up “screaming” online and what are the consequences of his scream? 12. Describe Kaito and how Sora meets him. What are Kaito’s interests and problems? Why is his online name NoFace? What is their friendship like and how does it evolve? 13. Talk about Mai’s dream and why it’s a dilemma for her. Why is it so important to Sora that Mai pursue her dream? How does he help her? 14. When Sora’s mother urges him to invite Kaito and Mai for dinner, why doesn’t he tell them about his illness? How does he feel about having them over? Describe their reactions and how the reactions affect Sora. Discuss whether you think he should have told them. 15. Analyze The Brilliant Adventures of Professor Crane and Friends, and the role it plays in Sora’s last weeks. How do the animals that Mai uses for each of them reflect that person’s character? 16. After doing research about his illness and its likely progress, Sora starts to “formulate a plan,” about which he says, “I am sure it’s right.” Find examples of foreshadowing about Sora’s final plan. Discuss why he made the choice he did and whether you might have made the same choice if you were in his position. 17. How do Mai and Kaito help Sora with his plan? Discuss their emotions and how Sora’s mother might feel when she finds out. Talk about the wish tree Mai and Kaito create. Discuss the final poem and how it relates to Sora and his story. 18. Baseball comes up throughout the story. In what ways is baseball important to Sora? Discuss the imagery he uses in his last e-mail to his grandfather. 19. Find examples of nature imagery throughout the story. Choose a few examples and discuss how they affected you as a reader. Why do you think the author draws so much imagery from the natural world? Have students find the poems in the novel and jot down their page numbers. Gather as a class and read the poems aloud. Then have students write their own short poems in the same spirit as those in the book. Each student should choose their favorite among the ones they write, illustrate it, and post it on a “Last Words of the Samurai” bulletin board. Many aspects of Japanese culture are mentioned in the novel, often briefly. Have the class brainstorm a list of topics to research, such as baseball in Japan; Japanese folklore; funeral customs; anime; manga; Hayao Miyazaki; and so on. Students, working alone or in pairs, should use at least two print sources and two digital sources to create a multimedia presentation on the topic to share with the class. Sora challenges Kaito and Mai with the question: “If you could do anything before you die, what would it be?” saying that the answer doesn’t have to be realistic. Have students write several answers to the question, share them in small groups, and compare their aspirations. You can also encourage your students to submit a wish at TheWishTree.net, and read what other people have made wishes for. Sarah Benwell lives in the picturesque English city of Bath, where she studied for an MA in Writing For Young People. Now she writes, runs creative writing workshops for teens and adults, such as the Young Writers Squad at Trowbridge Library where she’s also a writer in residence, and works retail at unsociable hours. Having seen a good chunk of the world, Sarah is a keen advocate for diversity in life and on bookshelves, and she loves nothing more than acquainting herself with both. As such, she co-runs DiversifYA.com: an online space that highlights diverse experience and promotes inclusion in YA fiction. *"Benwell’s deeply moving story is visceral...and psychologically acute in its portrayal of a dying teen and his loyal friends. Its shattering ending is sure to engender discussion among readers." "Benwell's gentle treatment of friendship and death with dignity will touch fans of John Green's The Fault in Our Stars." *"This is more a tale of friendship than of romance and one of living life to the fullest for as long as possible...this thought-provoking read offers teens a different perspective on living and loving life." 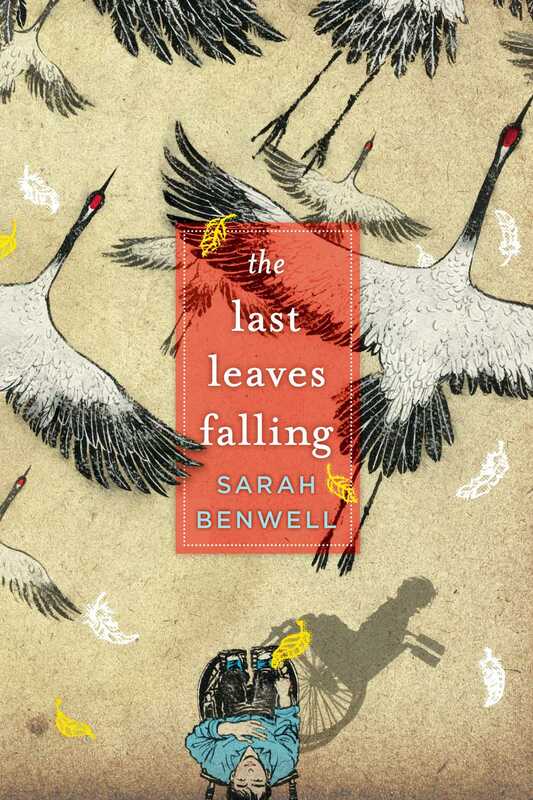 *"Benwell’s story is remarkably unsentimental, and her setting—contemporary urban Japan—adds a unique appeal...[T]he haiku Sora reads, and writes, are a perfect symbol for his life: brief in length but full of strength and subtlety." *"It’s a memorable and haunting story of a boy’s determination to seize control of the limited time he has left." *"An exquisite debut YA novel that serves as a guide to living a meaningful life, and the importance of family, friendship and self-knowledge."